South Sea Whale Fishery. A representation of the Ships Amelia Wilsona and Castor off the Island of Bouro with the Boats and Crew in the various process of Fishing, shewing the manner the Spermacetti Whales are caught also the mode of cutting them into to Ship, and Boiling the Oil upon the Deck. 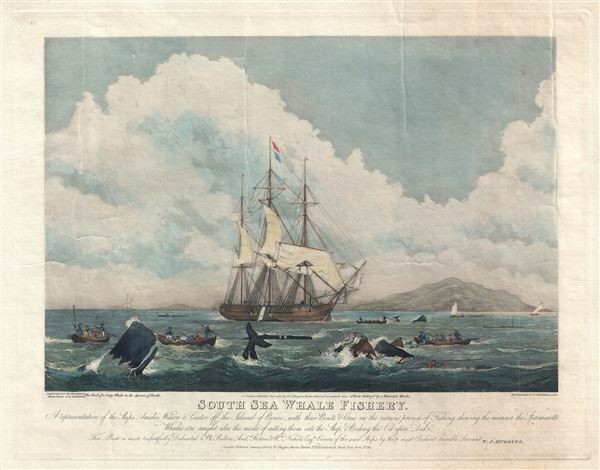 An iconic 1825 lithograph illustrating the South Sea Whale Fishery. This view was engraved by T. Sutherland based upon a painting by W. J. Huggins, official Marine Painter to his Majesty. The illustration express the excitement, richness, romance, and brutality of the whaling trade. In this image the sailors of the HMS Amilia Wilson do battle with numerous Sperm Wales with the island of Bouro in the background. Very good. Some creasing - see image. Wide margins. Even overall toning.